It's no secret that Caz hates being cold. Winter to her is all about trying to stay warm. It is jeans, soft jumpers, snuggling with blankets and a good book on the lounge. Caz used the Junkitz Fall stripe and Fall corduroy papers to tie in with the photo. BasicGrey Winter Rubons were added to the Junkitz Double-playz and secured to the page with brads. The large rub-on was added to the fall stripe paper and then cut out to form the centre of the daisy. Caz used the Carolees Creations onsert from the For Keeps Magazine to add the first line of the poem to the bottom of the page. 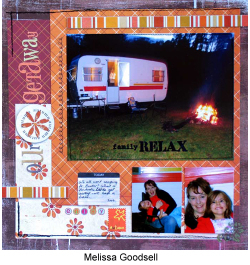 Usually every Autum, Mel and her family get away and go camping for a few days. This year they went at Easter time and spent time cooking marshmellows over the campfire, playing at the beach, and when it rained they stayed in the caravan and played board games or did craft (yes Mel took her scrapbooking to do just incase it rained). For this layout Mel chose a selection of warm autum coloured papers from Scenic Route combined with a sheet of Basic Grey Urban Couture Rum Rasin for the background. Mel has used the Carolee's Creations autumn postage stamp rub-on and the word "enjoy" from the FK onsert. The Heidi Swapp journaling spots are perfect for that little bit of journaling. Marni's favourite season is spring. She loves that it gets warmer but is not too hot and she loves that it brings the flowers back into bloom, her favourite of these being the frangipani. 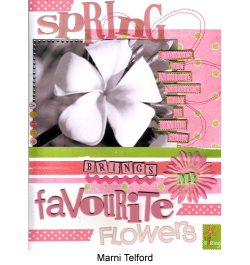 So for this layout she decided to celebrate spring through her favourite flower. 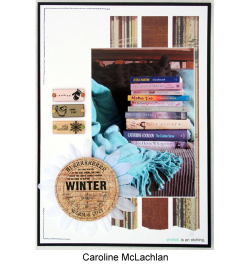 Marni used Carolee's Creations patterned paper for this layout and she cut the quote running down the right side of the photo out of one of the pieces. As it was pink and she wanted to place it on the pink background she cut the words out then glued them onto a green piece of the patterned paper then mounted this piece on chipboard and cut each individual word out again. She also free hand machine stitched a large flower behind her photo. Her tips for free hand machine sewing are to sketch your design first and don't worry if you don't follow the lines exactly as this adds the the appeal of this technique. 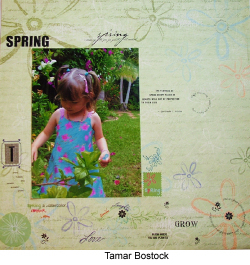 For this spring layout of Talia, Tamar has used Carolees Creations Family worn flowers patterned paper - it is so pretty - with soft words washed out over the outline of flowers. Using a variety of rub ons, Tamar has enhanced what was already subtly in the paper - creating the effect of layered patterns. Rub-ons are the onsert from this months For Keeps, and BasicGrey and Carolees Creations with similar themes all combine beautifully. You don't have to use a whole rub-on as it is - mix and match - only rub on partial pieces, like Tamar has done with the spring summer quote from the onset. Use the patterns in that paper as a guide for quotes - as in the flower centres ringed with a circular quote from Basic Grey. If you end up with part of a rub on where you don't want it - a good quality eraser will remove it or if you catch it in time the "pokey" tool - the one that makes holes in pages prior to sewing, is excellent for removing rub-ons that are only partially stuck. 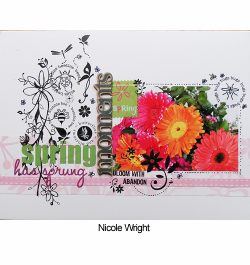 Spring - full bloom, flowers, pollen, fresh and new, these are all the things that spring means to Nic. These gorgeous flowers where a gift, so to keep the memory of them, Nic took a photo and figured it would be perfect for this weeks layout. Nic has once again mixed up a few differnt rub-ons - including BasicGrey Spring Black, SEI spring, and the Carolees Creations onsert from the For Keeps magainze. Rub-ons attach easily to photos, and give a great effect. Nic has also layered her rubons over the top of each other, for a collage effect. 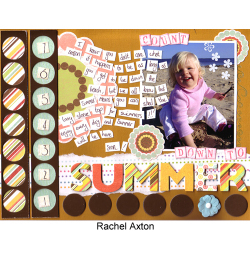 Rach wanted to create a bright and busy layout which shouts summer is almost here!. This photo was perfect for such a layout, Megan getting into the beach in her winter clothes!! Rach decided to use the 'frame' outside of the Heidi Swapp chipboard rubon kit to create two series of circles down the left hand side of the layout. That combined with a mix of bright colours and patterned papers, and lots of wording.